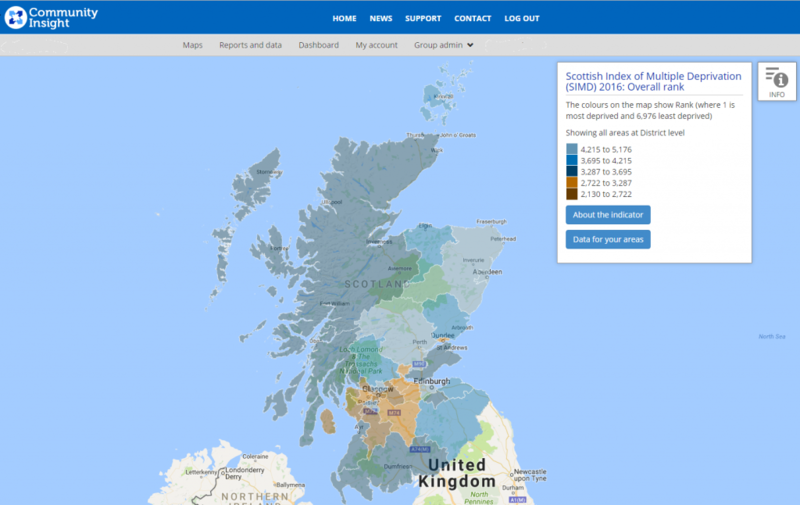 In case you haven’t already spotted it, Community Insight Scotland now has the 2016 Scottish Index of Multiple Deprivation (SIMD) data for you to use. As with all other indicators on Community Insight Scotland, you will be able to view the data on the map, view data for your specific areas and compare on the dashboard. Released by The Scottish Government, The Scottish Index of Multiple Deprivation (SIMD) combines seven different domains (aspects) of deprivation: Income; Employment; Health; Education, Skills and Training; Geographic Access to Services; Crime; Housing. Within Community Insight Scotland, you can view data for both the overall rank and for each of the individual domains. Where to find The Scottish Index of Multiple Deprivation in Community Insight? For the majority of you the SIMD 2016 data can be found with the Deprivation theme on the maps page. However, if you have customised your themes and indicators and do not use the Deprivation theme, then the new SIMD 2016 indicators can be found in the Unassigned theme To add these new indicators on the map, you must go to the Manage Indicators page and move the indicators into a theme. For guidance on how to do this check out this short video. If you have any questions about using the SIMD, then give us an email on support@ocsi.co.uk or call us on 01273 810270.